Model T Ford Forum: Does it have to be wrong to be right? Does it have to be wrong to be right? Model T Ford Forum: Forum 2012: Does it have to be wrong to be right? If you're a stickler for authentic detail, the coil box terminal nuts present a dilemma. I'm pretty sure the steel one shown here on the right is the genuine article. 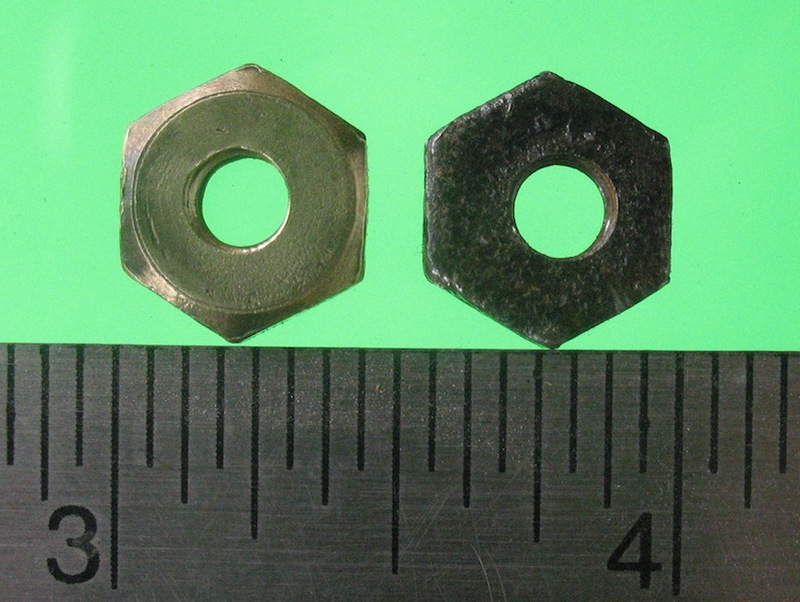 The thread is 10-32, a very common size, but the nut is 7/16" across the flats. As far as I've been able to find, you can't buy a 7/16" nut with 10-32 thread these days. Sometimes you see them in brass, like the one on the left, but you won't find those for sale today either. I assume the 10-32 nuts on most coil boxes today are the smaller modern size due to the original ones being lost over the decades. Sometimes you find the old steel, old brass, and the modern nuts all on the same coil box. Anybody know of a source for nuts in the original size? By the way, if you look carefully at the steel nut you can see the reason for the question about wrong being right. Well if you can't find them, find a machinist or some old coil boxes you can get some from. It's interesting how your hole is so far off center. I mean the hole in your nut. Well I mean the hole in your nut in the photo. What I'm trying to say is I mean... Oh to heck with it. You would be doing yourself a large favor to use all brass hardware for your coil box electrical connections. Most of the original hardware was copper plated steel but the copper is gone in almost no time due to galvonic corrosion which Ford was probably not aware of since they often plated brass directly on steel with flash plating and it was gone in no time once it got scratched and exposed the dissimilar metals (steel and brass) to air. I strongly recommend you use 10-32 brass machine screws, washers, and nuts for your wiring connections to the coil box and then solder the machine screw head to the internal coil box contact and you will have a solid setup that will never cause problems. I agree the brass would be better. Reason being as John said is much better conductivity. Also I learned after much travail a few years ago about using old coilbox hardware. My 1919 Roadster was missing intermintely and I finally found it was the coil boxes "original"
The orignal copper coated bolts were slightly corroded due to the copper plated steel bolts. I bought some new ones and man what a difference! To each his own but electrical connections have to be good. I researched this part # and recall the 10-32 coilbox terminal nut (T-472A/B) was changed from 7/16 across flats to 3/8 across flats sometime in 1922. This same nut was used in 32 places on the Model T.
I have a coffee can full of both types in steel or brass if you need a few. Been there. When I was in High School (1965) I made a bunch for my '22 TT. I had to take metal shop...so, a project was a project. I remember the shop teacher reminding me that they sold those thing at the hardware store! A bit of 7/16 brass hex stock and a lathe was all it took. I drilled and tapped an inch or so at a time, as I recall, then cut em off with a real thin parting tool. My drill didn't wander quite as bad as Old Henry's did, but they did come out a bit crude. That's going to be my project in shop class tomorrow. I was wondering if the originals weren't brass to begin with anyway. But all I've ever seen were steel. Now if you're interested in copper plated steel, find yourself someone who does chrome plating. In a lot of cases when the plate with chrome they plate with copper first. Especially if what they're doing is show chrome. That's not necessarily true if it's chrome plated just to protect metal. In those cases they may only put the chrome on. But it wouldn't take much to put the nuts on a chunk of wire and dip them to clean them and then dip them in the copper. If you plating a few, the wire dip would work but it's time consuming. You need at least 15-20 minutes to get a flash plate that will last for any time at all. I have a couple of rotating drums I use for plating screws, nuts and small parts like that. The copper plating drum is plastic mesh with several copper strips inside to maintain electrical contact with the axle. The small parts just tumble in the drum for an even plate. Larger production shops do the same, just larger drums.